Play-Doh Challenge 2015 – with Giveaway and Discount Code! Looking for some activities to do with your kid on a Saturday? 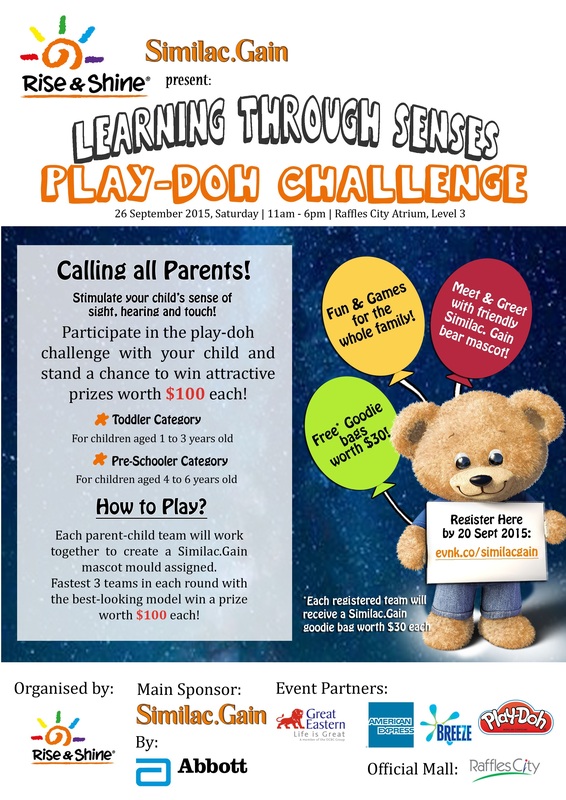 Why not pop over to the Play-Doh Challenge held at Raffles City Shopping Centre on 26 September 2015 (Next Saturday!). You have to register as a tag team with your child aged 1-6 years old and the competition includes working together to create a Similac.Gain mascot. Here are some details of the Challenge. Do continue to scroll down for a discount code for registration and also a giveaway! 1. Register online and come down to Raffles City Atrium (Level 3) on 26 September 2015 (Saturday). 1.There are 7 slots of competition timings available across both age-group categories and 3 teams from each slot will be awarded with the top 3 prizes worth $100 each. 2. Registrants must report on time. Late comers will be forfeited of their participation, goodie bags and registration fee. 3. No changing of slots and refund of registration fee is allowed. 4. Time reflected on ticket includes registration process, competition and prize presentation. Giveaway for Beautiful Chaos readers! We will be giving away 1 parent/child team tickets for the Play-Doh Challenge. Giveaway will close at 2359 on Saturday 19 September 2015, and the winner will be selected by Sunday morning. 1. Like Beautiful Chaos facebook page. 2. Like and share the post on the Play-Doh Challenge Giveaway. 3. Comment on the post that you have already done so! If you would like to register directly, you can get 20% off with this code: VBC20 This code is only valid until 21 September 2015, Sunday, 12am.